There are many types of compasses ranging from tiny thumb compasses to complex high-tech gadgets. 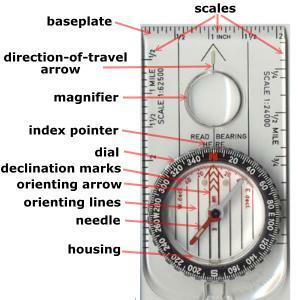 For most hikers and outdoors guys like us, an orienteering compass works just great and that is what we'll discuss here. Not all compasses include each of these parts and some compasses include even more. There is a huge magnetic field around the earth. It is huge, but it is not very strong. The magnetized needle in a compass is aligned with this magnetic field. As the image below shows, the composition of the earth acts as a huge bar magnet sitting upside down in the middle of the planet. 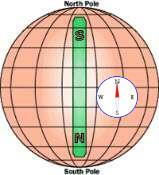 Since its South end is at the north pole and its North end is at the south pole, the North end of a compass needle is pulled north. Your compass has to have a very light needle sitting on a pivot that has almost no friction. This is because the earth's magnetic field is weak and would not be able to turn the needle. You can even make your own compass just for fun. The Tate's Compass company manufactured over 1 million compasses a year. But, one day the red and white paint got mixed up so all their compasses pointed the wrong way. The company went out of business and the well-known saying was created:"He who has a Tate's is lost!" Is it possible to get this guide as a pdf? @Gaurav - No, this website is not available as a PDF file. Is the declination arrow and the orienting arrow the same thing? @Bill - Yes, you can adjust the orienting arrow for declination. See Declination page. I have learn a lot about compasses. Did I understand correctly? South of the equator, the red painted end of a compass needle points to the South Pole? If so are Scouts in Australia taught to orient everything and read maps based on everything pointing south? @Ralph - No, the red end always points to magnetic north, wherever you are.